However when you set up the groups and usernames in the file, the usernames are case-sensitive. The usernames in the Options file must match what is shown in the License Manager itself when a user checks out a license. For example 'USER', 'User' and 'user' will be seen as different users. This may or may not match the Windows username. For example here I’ve changed my Windows username to ‘Support’. However when I checkout a Simulation license, the License Manager shows the user as ‘support’. The source is the capitalization style that the user enters when they first logged on to a computer. Without a ‘roaming’ Windows profile account, a change to the capitalization of a username would require a re-creation of the user profile to have it match in the License Manager. If we setup the Options file with the username ‘Support’, it won’t be found as the License Manager considers the user as ‘support’. 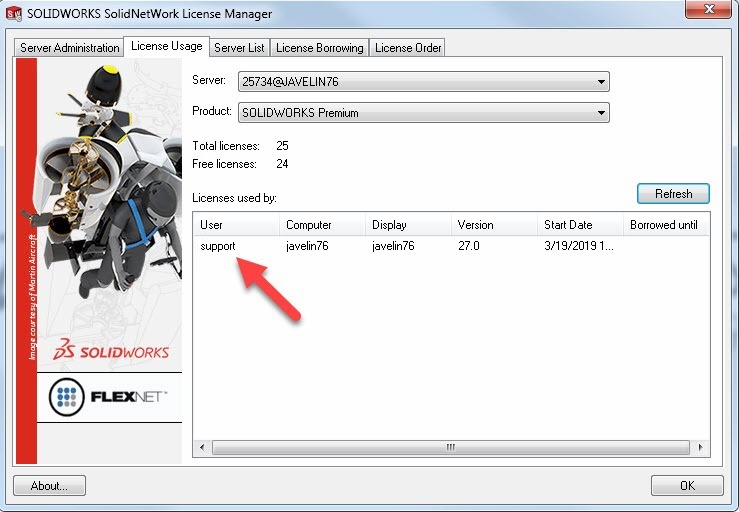 Here I’ve reserved all 25 SOLIDWORKS Premium licenses to the user ‘Support’. When we try to enable the Simulation add-in, it fails to obtain a license as there are no licenses left for username ‘support’. There is a FlexLM option that allows you to make usernames case-insensitive to avoid this situation. At the top of the Options file, add the line GROUPCASEINSENSITIVE ON. Now it will see the user ‘Support’ to be the same as ‘support’.